In this abstract shape, White can force Black into a connect and die. ... Black plays inside at , the vital point of the farmer's hat eye shape. If White does not connect at , Black can make the eye false by playing there. The net result is that White has an eye in gote, also called a half eye. This is a common line of play in life and death problems. In the farmer's hat half eye, note the importance of the stone or similar, which prevents White from escaping out. This White group is dead, because it has two half eyes. 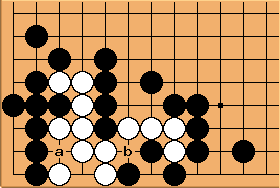 That is, either a play at a or b reaches one eye in gote, so that Black can destroy the other one. How many eyes can White get? ... but not two eyes. In other words, White gets one eye in sente. This is also a common line of play in life and death problems.